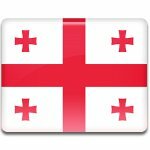 On January 14 the people of Georgia celebrates the Day of the State Flag. The current flag of Georgia was adopted by Georgian Parliament on 14 January 2004 and formally endorsed via a presidential decree on 25 January 2004. The state flag of Georgia is also known as the Five Cross Flag because it contains a red-on-white Jerusalem cross, a large crutch cross surrounded by four smaller Greek crosses. It was originally used by the Georgian patriotic movement following the country's independence from the USSR in 1991. In early 2000s this flag was adopted by the United National Movement, the largest opposition party led by Mikheil Saakashvili. It symbolized popular resistance to the rule of Eduard Shevardnadze. In November 2003 Shevardnadze was forced to resign after the Revolution of Roses, and in January 2004 Saakashvili became the new president. The Parliament adopted the Five Cross Flag as the Georgian historical national flag on January 14. This day is now celebrated as the Day of the State Flag. The national flag of Georgia is a white rectangle, with in its central portion a large red cross that touches all four sides of the flag. In every corner there is a small bolnur-katskhuri cross of the same color.